Please select a size. UK 2 - In StockUK 3 - In StockUK 4 - Low StockUK 5 - Low StockUK 6 - In StockUK 7 - In StockUK 8 - In StockUK 9 - In StockUK 10 - In Stockview larger sizes Please select a size. 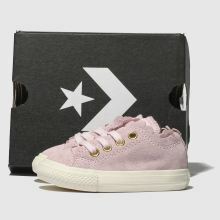 The perfect way to bring some sunshine into their look, Converse delivers this Chuck Taylor All Star Lo for fashion-forward kids. 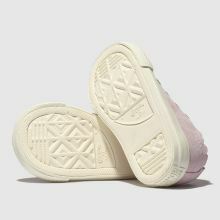 The summery profile boasts a pink suede upper with scalloped edging for a sweet finish while glam gold eyelets complete.